For years, organizations have recognized a gap in the executive presence their leaders need to drive business results. Yet there was no precise way to define, measure, and improve executive presence. This need led Bates to invest in extensive research to develop the Bates Executive Presence Index™. The Bates ExPI™ is an innovative, multi-rater assessment of leadership and influence. Leaders gain concrete, actionable insights that enable them to learn how to engage, align, and inspire to drive better business outcomes. It’s now used by coaches from around the world, including Fortune 500 talent development professionals and independent coaches. Executive presence is a primary reason that organizations seek coaching for leaders, second only to overall leader effectiveness. The Bates ExPITM draws on research in leadership, management, communications, psychology, philosophy and ethics, and social action theory. Register Early and Save! Online registration is available below. FOR: . More dates are available below. Register 240+ days prior for maximum savings! Register 180+ days prior and save! What Will You Learn in Bates ExPI™ Assessment Certification? The Bates ExPI™ Assessment Certification program provides executive coaches and talent development leaders with an opportunity to experience the Bates ExPI™ for themselves to better appreciate the uniqueness of the assessment and the reliable Bates process of ensuring that the data translates into insights and actionable feedback. Whether you attend an in-person program or a virtual program that combines self-paced learning and live online sessions, you will gain confidence and competence in administrating the Bates ExPITM. In addition to learning the Bates Model of Executive Presence, you’ll get hands-on practice in analyzing and interpreting ExPITM data as well as opportunities to work with a partner to master our process and conduct powerful orientation and insights meetings with clients. 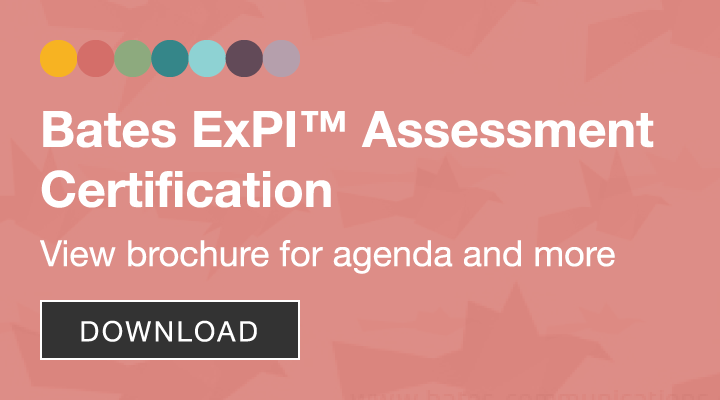 Is Bates ExPI™ Assessment Certification for you? The Bates ExPI™ is for talent development professionals who want to bring innovation and fresh insights to their work, whether internal to the company, or in their private practice. Adding the ExPI™ to the coaching toolbox complements your assessment strategy and works well as an advanced instrument paired with psychometric assessments, as well as company 360 instruments. The ExPI™ aligns closely with and provides deeper meaning to interpreting leadership competency models. The course also gives you a chance to meet and interact with highly qualified, seasoned coaches who are joining our growing, global community of practice to share ideas and learn about new research. Why Choose Bates ExPI™ Assessment Certification? Our certified practitioner community tell us that the Bates ExPI™ Assessment Certification program ranks among the best professional development experiences they’ve ever had. Not only are they able to incorporate innovation into their work and differentiate their practices; they say the experience they have working with our Bates team makes it well worth the investment. Many have been seeking a tool like this for years. The ExPI™ enables them to bring science and data to address what was thought of in the past as a soft and intangible aspect of leader development. A more concentrated learning experience, as we cover the material in two days rather than spreading the content out over several weeks. Bates is an innovator in leader development, launching the first-and-only research-based, scientifically validated multi-rater assessment that measures a leader’s executive presence and influence. 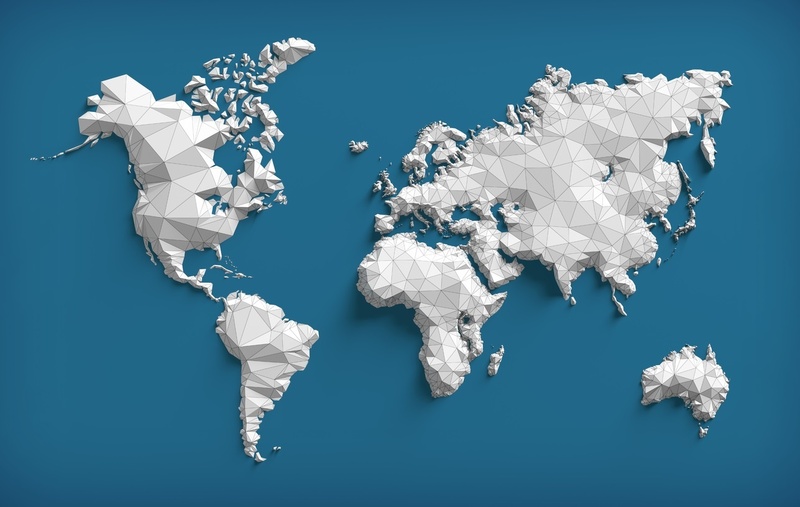 Our seasoned facilitators have used the Bates ExPI™ to help senior leaders at the world’s leading companies in over 40 countries accelerate their strategic agendas, deliver bottom line results more effectively, and enable innovation and new business model creation. Our deep expertise in communicative leadership sets us apart and allows us to help individuals, teams and organizations move where they need to go. Programs are led by seasoned coaches and facilitators who are certified in the Bates ExPI Assessment and Model. Our facilitators are themselves coaches with a track record of helping senior and high potential leaders excel in their roles. They strive to create a great learning environment for the senior level practitioner who is looking for ways to grow, develop and innovate. Which program do you want to attend?